After meeting online, James Dunne and Peter Hanley would meet up for their first date a few days later where they realised this was more than your average first date, both feeling that special spark between them. With such a fantastic first date both men would soon start dating afterwards, which they would follow up by moving into together. As if the universe itself was sending them a sign, the pair would find a ring while they were attending a Kodaline concert in Marley Park, with Pete having had thoughts of a proposal in the lead up to teh concert. Seizing the opportunity, Pete waited until the concert was nearly over to get down on one knee, asking James for his hand in marriage. “He thought I was joking first, then he realised it was for real and started to well up with tears. When he finally said yes, we got huge cheers from the crowd around us and then the fireworks went off over the stage. It really was a magical moment,” Pete reveals about the proposal that would lead to their dream day. How was your experience with The Kilkenny River Court Hotel? The ceremony would take place on August 3, 2018 at the always remarkable River court Hotel located in Kilkenny, with the famous and historic Kilkenny Castle on the banks of the River Noir serving as a beautiful backdrop. Aoife Kiely was the guys’ photographer for the day, living up to her reputation as a calming, gentle and non-intrusive photographer by helping to put their nerves at ease so she could capture intimate and personal wedding photos that they are sure to cherish forever. Lisa from Lisa’s Celebration Cakes, located in Co. Carlow only across from where Pete and James live, helped turn an idea of the guys’ dream cake into reality, blowing their expectations of the water and helping create such a magical part of their wedding day. Having seen the wedding band Vegas Nights a few years ago, James knew that they were the band for his and Pete’s wedding. On the night of their wedding, they had every guest boogying on the dance floor from their first song to their last. For the newlyweds first dance, the band played a rendition of Beyoncé’s ‘XO’ which was a spectacular moment for all who saw. Mairita from My Dear Florist, located in Carlow Town was the florist for the big day, capturing Pete’s ideas and turning them into stunning floral centrepieces. Arriving to the venue a day before the wedding, Mairita would set up the floral centrepieces that would blow everyone who saw them away. Lauri and Denise of L&D professionals of Enniscorthy Co. Wexford were behind the marvellous make-up of the day while hauntingly good hair was done by Susan of Buí Hair Salon, Co. Wexford. Beautiful balloons which their guests loved on the day of the wedding were provided by Sarah from Bunjee.ie, located in Wexford. Stephen from Walter Bourke Jewellers Enniscorthy was behind the stunning wedding bands, with the guys’ giving special praise to Stephen who helped them with their design and made it a reality. 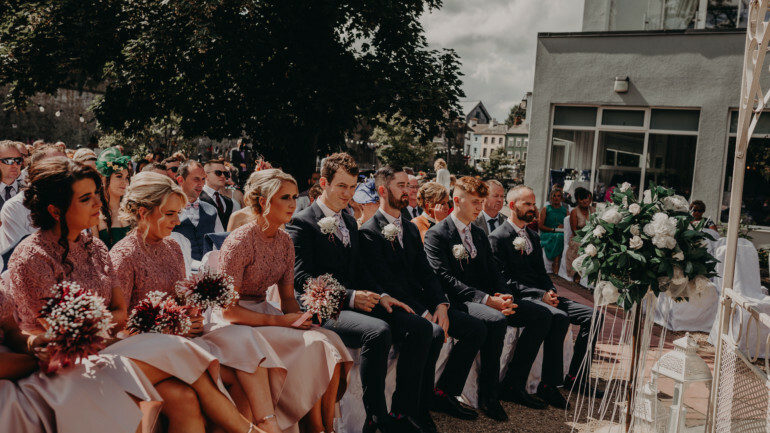 The bridal party for the big day consisted of Graham Dunne, Abbie Dunne, Rachel Gartland, Eoin Redmond, Martina Hanley, Alan Hanley, Siobhan Ryan and John Franklin. Throughout the day, the two grooms made sure that every moment was as special as the last, from regularly meeting up and spend time with each other to constantly checking their watch so time would seem slower and the day longer. A quirky and beautiful idea the men had was to have their best men on the morning of the wedding deliver each other new bottles of fragrances that they had each picked out for each other. This meant that every time they smelled that scent afterwards, they would be reminded of their dream day. Now happily married, both grooms share their favourite memory of the big day, the walk down the altar, where James linked arms with his mother and walked towards the altar where the love of his life stood, smiling from ear to ear waiting for him. “That feeling of butterflies and excitement like Christmas as a child, a wave of pure happiness caught by the atmosphere of everyone that surrounded us words can only describe the feeling but I feel delighted for any brides and grooms to catch that feeling as it so euphoric and really makes you realise it’s the right time, right location and definitely the right person,” Pete elaborates on the pure ecstasy both of them felt during that moment. “Make sure the day is focused on you two and your love, not what is expected by people or what you feel others would want but allow the day to fully introduce your guests to the couple being married. Don’t rush into picking the roles too early and again make sure it is what you both want no regrets and no doubts it really makes it more special when it is just the couple who decide,” Pete kindly offers his advice to LGBT couples planning on making the big jump into the exciting world of marriage.